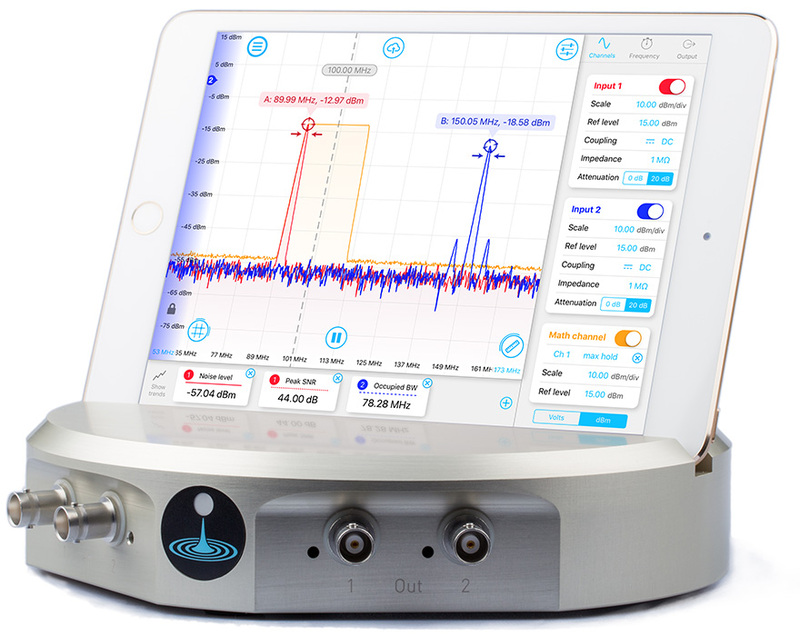 Analyze dynamic signals in the frequency domain, all from an intuitive iPad interface, or with Python, MATLAB, and LabVIEW. The multitouch user interface really shines with Moku:SpectrumAnalyzer. No need to wrestle with frequency range settings and start/ stop/ span inconsistencies. The Spectrum Analyzer features a frequency range of 200 MHz (extended to 250 MHz in software) and resolution bandwidths down to 1 Hz, all with super fast update rates thanks to the DSP power of Moku:Lab’s FPGA. Moku:SpectrumAnalyzer inherits the best features from Moku:Oscilloscope: tracking cursors, averaging, persistence and, of course, simple sharing of data via DropBox, iCloud and email. A math channel in Moku:SpectrumAnalyzer includes options to display Max Hold or Min Hold data of a channel. You can display your data with a log or linear power spectrum or power spectral density or even visualize the evolution of spectra with 3D waterfall plots.